No Australian bird seems to have as much charisma as the spectacular Superb Lyrebird. Their size alone is imposing (up to 1 meter male & 600mm female in length) and they are the largest of all our passerine (song) birds. The male’s filmy train of tail feathers, shimmering over his head in display, is breathtaking, and his voice, which resounds powerfully through the damp, tree-fern gullies, is unmatched worldwide in vocal repertoire and mimicry. All birds produce sounds by forcing air past membranes stretching across their syrinxes (voice box), but the male Lyrebird’s is worked by 3, instead of 4, intrinsic muscles giving amazing flexibility to his calls. The pitch of the notes is controlled by muscles which adjust the tautness of the membranes. It is also the Superb Lyrebird which gives the family its name with their spectacular tail of fanned feathers, when spread out in display, looks like a lyre (a musical instrument of ancient Greece). The outer two bigger white and brown feathers appear like the frame and the inner thinner feathers are the strings. There are two species in the family of lyrebirds – the Superb Lyrebird and the Albert's Lyrebird. 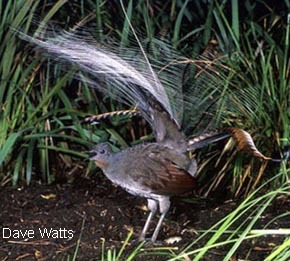 The Albert's Lyrebird is similar in appearance to the Superb Lyrebird, but is smaller and darker, with a rich chestnut/red colour. The male does make the mimicry calls but is less elaborate in appearance than the Superb Lyrebird and does not have the outer lyre-shaped tail feathers. The range of the Albert's Lyrebird is restricted to a small area of sub-tropical rainforest near the Queensland/New South Wales border, which includes the Mistake Mountains, Nightcap Range and the Border Ranges and due to its specialised habitat, the Albert's Lyrebird is an endangered species and the further clearing of rainforest will probably lead to this beautiful bird's extinction. The Superb Lyrebird lives in wet/damp forests of either eucalypt, rainforests or wet woodlands, often very rugged and hard to access, east of the Great Dividing Range to the coast, ranging from southern QLD down to the Dandenong Range Vic., with introduced colonies in Tasmania. They are a ground-dwelling species, but roost in trees at night. They are sedentary, rarely moving large distances and generally staying in a home-range about 10 km in diameter. The Superb Lyrebird looks like a large brown pheasant. The wings are rufus (brown-red) in colour with under parts pale grey, the bill, legs and feet are black, eyes are brown. The adult male has an ornate tail, with 2 long central wire-like plumes, 12 filamentary (thread like) rays and 2 outer broad lyre-shaped feathers. In display, they assume the shape of a lyre and fully spread covers 1.5metres. The tails of females and young males are long, similar to a pheasants’ tail, but lack the specialised feathers for display. Young male Superb Lyrebirds do not grow their lyre tails until they are 3 to 4 years old. Until this time, they usually group together, practicing their sequences of calls and are known as 'plain-tails'. The Superb Lyrebird's strong and melodious song is famous. About 80% of the song consists of expert mimicry, with both natural and mechanical sounds imitated and joined together in a rousing medley. They are capable of imitating almost any sound and emit a series of whistles and cackling notes that are used as territorial calls, as well as a loud alarm shriek. Mixed in with their own calls, clicks and song, you will usually hear them mimicking loud clear sounds made by other birds and mammals – including humans. His cacophony of sounds can include anything heard in the bird's immediate surroundings, such as chainsaws, mill whistles, car engines, alarms, jack hammers, babies crying, car horns, cameras (single shot & motor drive! 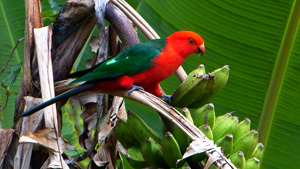 ), trains, dog barks and local native bird calls. They sing throughout the year, and scientists think that the mimicry helps them to not only attract a mate but to vocally set out their territory and defend it from other lyrebirds. The young male birds learn their sequences from local elders, as the songs and mimicry of individual birds in any group are very similar in form. Each song can last up to 20 minutes! Lyrebirds feed mainly on the ground and eat ground-dwelling insects, spiders, worms, occasionally seeds, small invertebrates, crustaceans, myriapods and snails that they find by scratching among the leaf litter. They have powerful legs with long toes and claws (3 forward, 1 backward), which are ideal for raking over dead leaves and soil. Lyrebirds are very shy, wary birds and when seen they are normally just a blur as they run and dodge rapidly through the dense forest underbrush. When threatened, they escape by running and dodging rapidly through the undergrowth while emitting high-pitched shrieks of alarm. With their short, round, weakly-muscled wings they rarely fly, however their wings allow them to jump onto tree branches or rocks – and then glide back down to the forest floor. Although they seldom fly, they roost in low trees at night. They also tend to forage alone, but females and young males may be seen feeding together. Lyrebirds have been seen to take refuge in wombat burrows (exiting hastily if the owner is at home). It has been recorded that firefighters sheltering from a bushfire in a mine shaft have been joined by several Lyrebirds! The Superb Lyrebird has an elaborate courtship ritual, centered around a number of display mounds. Built by the male bird, this mound is made of scratched earth and measures up to 90 cm wide by 15 cm high. Each Lyrebirds territory may be up to 2-3 hectares and include 10 to 15 display mounds, which the displaying male may visit daily in the months of courtship. When courting, the male bird stands on one of his dirt mounds, making himself easier to hear and be seen, and breaks into his routine, spreading his magnificent tail feathers up over his head, vibrating, prancing, dancing and stamping this way and that. Then he pours forth his song which is a medley of cadences and mimicry, punctuated by resonant territorial chords, buzzing and clicking to attract his intended. The tail is only spread for mating courtship purposes. The display period is from April to September, with breeding occurring mainly in May to August. The females occupy separate foraging territories overlapping those of the males. She is attracted by the male's display and song choosing her partner and mating with him itinerantly on or near the mound without forming any pair bond. Before copulation, the male will stop singing and shimmering to make a soft clicking sound. Male birds will mate with several females, and although they appear to know where the nests are, they take no part in building them or incubating and feeding the young. It is the female who builds a dome-shaped nest of leaves, twigs and small sticks, which can be on the ground, on rocks, within tree stumps or in tree ferns and caves up to 3 meters off the ground. The nest is lined with ferns, feathers, moss and rootlets. Usually, only one pale purple-brown oblong-oval egg, streaked and blotched with black is laid, and which takes up to a long 50 days to hatch, as she must alone feed herself each morning and the egg cools while she is away making its development slower during the 3-6 hours she is not incubating it. The new born downy-white hatchling remains in the nest for six to ten weeks, with the female unaided carrying worms and other high protein food in her cheek pouches back to feed her chick. She also carries her chicks’ droppings away from the nest and discards them in a stream or buries them. After breeding males, females and young gather in small locally foraging groups of 4-5.